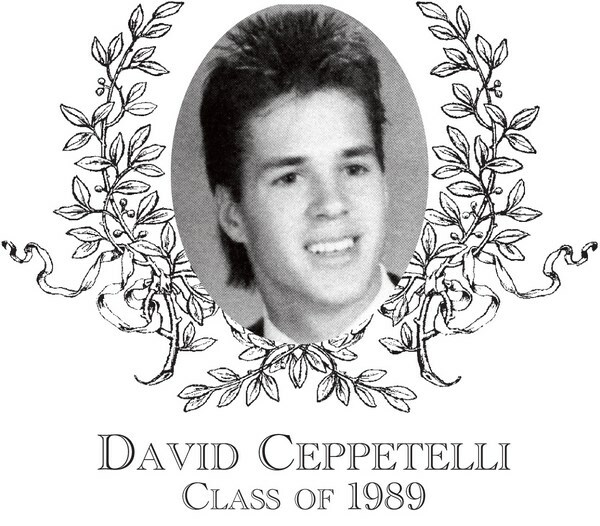 David Ceppetelli graduated from Bartlett in 1989. He excelled in both football and baseball. He was also a member of Bartlett�s Student Council. Dave started his athletic career playing varsity football all 4 years. He was the starting quarterback his sophomore year and continued to do so for the next three seasons. He captained the football team his senior year. Dave threw 31 touchdowns, had 13 rushing touchdowns and passed for over 3,500 yards. He had the game winning touchdown pass against Southbridge not only his sophomore year but his junior year as well. He won the Thanksgiving Vincent T. Sabatinelli Most Valuable Offensive Player Trophy his Junior and Senior year. Dave was a Border Conference All-Star and Central Mass All-Star and was awarded the Gareiri Jewelry MVP award for the 1988 season. One of Dave�s fondest memories on the football field was the privilege to be coached and mentored by the late Mr. Robert Daigle. He played only two seasons of basketball, his freshman and sophomore year, but was a member of both the JV and Varsity teams. Dave was a talented guard with an exceptional shooting touch. He was on the 1986 District Champion and State Runner-up team. Dave also received 3 Varsity letters in baseball, and was a co-captain of the team his senior year. Dave was a pitcher. His coach Bob Pepka stated �he was a competitor on the mound with a sneaky fastball and an excellent curveball�. He also batted .300 his senior year. Coach Pepka states �he was a good hitter and ran the bases extremely well, especially the delayed steal which he ran to perfection�. Dave was a graduate of WPI where he continued to have an outstanding football career. He was a WPI quarterback for 3 years and was named New England Player of the Week on 3 occasions. An outstanding career at WPI enabled him to receive the honor of being inducted into the WPI Hall of Fame in 2003. He has not slowed down after leaving the collegiate sports scene and he competed and placed first in 2003 and 2004 for the New England Adventure Racing Team. Dave is an Engineer and works for Tata & Howard. He and his wife Carley reside in St. Johnsbury, VT with their two children Peyton, 13 and Ella, 12.